We have an adamantium-laced deal for you at Amazon today! 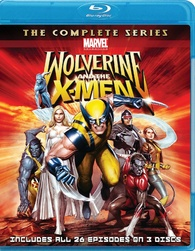 Amazon is offering 'Wolverine and the X-Men: The Complete Series' for $21.49 (52% off suggested list price). With 45 years of best selling comic books, a massive fan base spanning all ages and four feature films grossing over one billion dollars at the box office, the franchise is a proven phenomenon. The 'Wolverine and the X-Men' DVD volumes 1-6 have already sold more than 550,000 copies to date. Though the animated series is targeted to boys from ages 6-11, it also appeals to comic book fans of all ages with its intelligent writing and unique animation style. Click here to unite mutants in your home video collection!